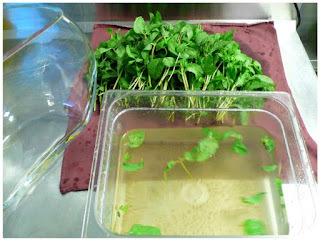 If you make it properly, you will have fresh and healthy looking sprigs for several days - or even a week! 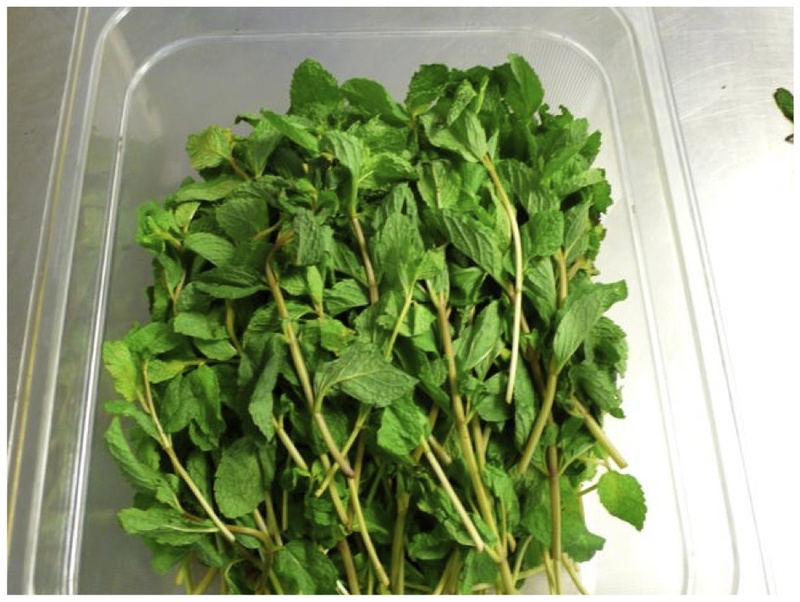 Really lucky bartenders are having a garden with lots of mint shrubs - however even they might have problems in the winter... And we are not yet in a position, that we can tell guests, that they cannot have Mojitos, Juleps and other minty drinks, because mint is out of season! 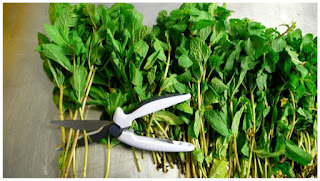 Here in the Middle East, it is even more difficult to get healthy mint; in culinary [especially MESA cuisine] a lot of mint is used, but almost everything is processed (at least shredded) so you can [fortunately] not even imagine, how the mint looked before! Long story short - here I am with a step by step explanation to get fantastic looking mint for at least a week!!! 1. 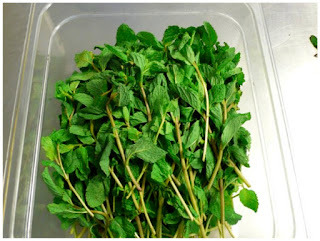 This is the mint we get from the cold kitchen. I have to be honest, that this mint looks quite healthy, if you compare it with other days... but for the preparation it makes no difference! 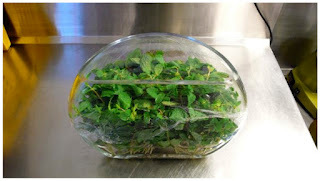 If you would directly use this sprigs for a Mojito, you would need ages to prepare the drink, as you first have to clean it of wilted leaves and dirt. 2. 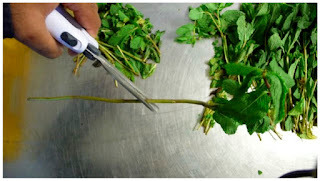 After putting mint onto your working surface, you have cut the rubber band, which holds the bunch of mint! I like to use a pair of scissors, because I need it also for later and it is saver than a knife! 3. Next step is to arrange the mint for further procedure and clean the stems from withered leaves and dirt. Be also carefully and follow health and safety work practices! 4. If the stems are long, cut them - keep in mind, that you have to put the mint later on in water, so you still need a bit of a stem (no leaves supposed to be in the water!). Don’t be shy to cut a good part of the stem - and also to throw away a lot! 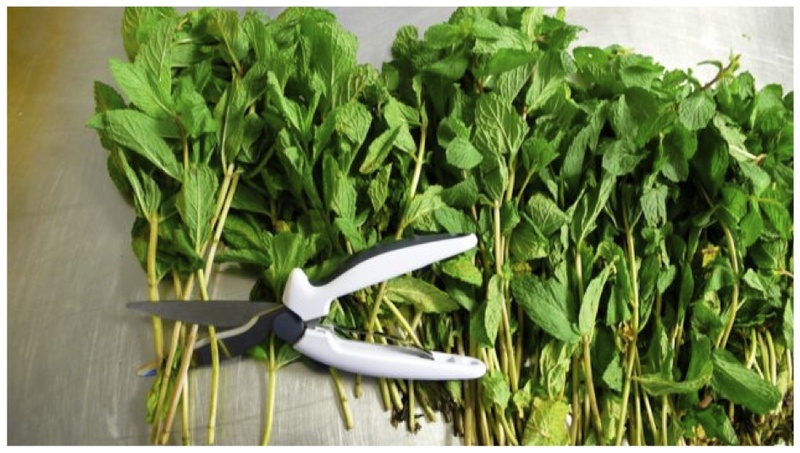 The better you clean the mint, the longer it will stay! 5. 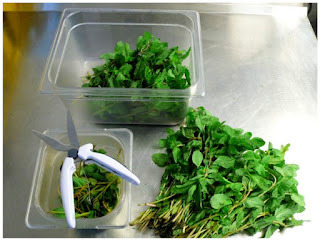 I put directly the cleaned mint in one big container - and the rest in another container, as I then can throw the cruft into the garbage and have a clean and organized working area! 6. 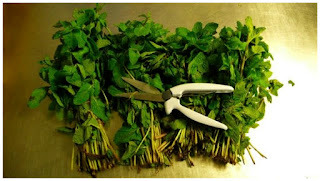 Throw all withered leaves and cut stems into the garbage and clean the working area! Also double check, if the mint is free of any other splints, grass et cetera! 7. Now it is time for washing the mint! If you don’t have cold water (like here in the Gulf) use also some ice to have really cold water - this is essential! 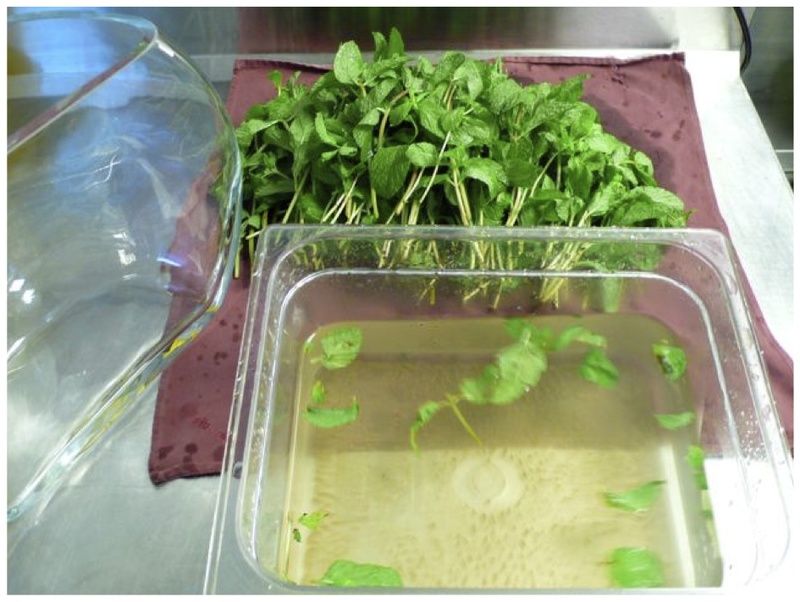 Let the mint sit in the water for longer than 5 minutes! Then drain it and wash it again (same procedure)! The mint refreshes in the water and looks already stronger, fresher and livelier! 8. 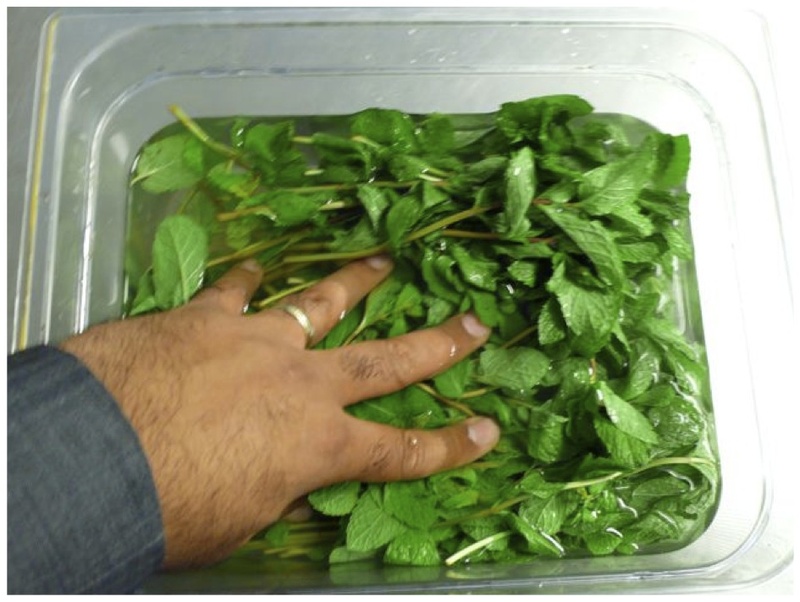 Take the mint out of the water! Like shown in picture below, very often the mint was sandy and dirty - if it is not clean yet, wash the mint again! 9. Put the mint into a big container, a vase et cetera. Stems side down, that they can stand in water! Next step is then to pour some soda water / carbonated water to the mint! 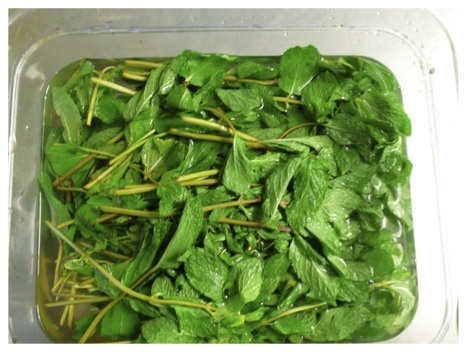 I don’t know why, but mint is reacting very positive, if you are putting it in carbonated water! 10. Just don’t put too much soda in! All stems supposed to stand in the water, however the leaves should stay dry! 11. Cover the container with cling film. 12. Label the container and refrigerate! 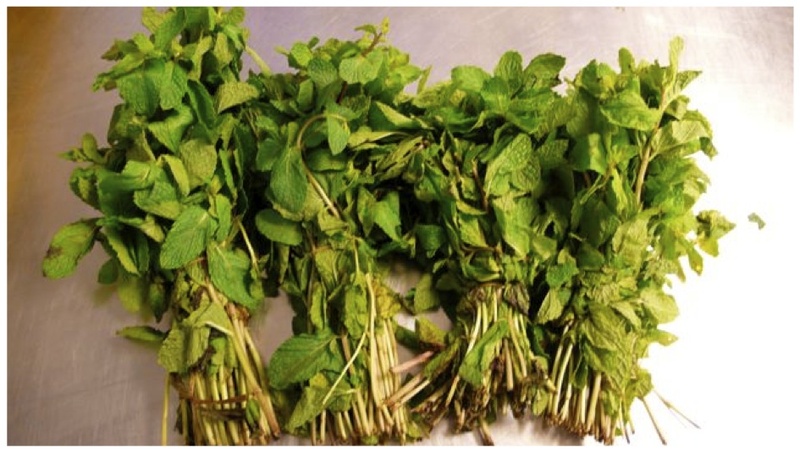 Remember, that mint shouldn’t be stored at temperatures below 0°C! Fridges sometimes become colder at the back - so store the mint at a nice place in the fridge or walk-in refrigerator! 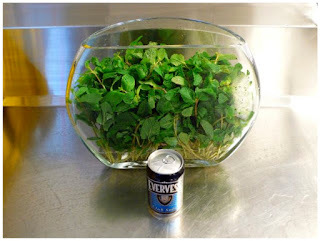 If you need some mint for the bar, transfer a part into a smaller container with water - and please cover your stored mint again, that it remains longer time!